Never would have guessed you could make chalk yourself. We go through it like crazy! I think the kids will have a blast making their own – and their own colors. Thanks for sharing. Wow interesting post. I also wanted to create my own chalk. Thanks for sharing. This sounds like great fun. Never had any idea you could do this. Gonna write a note so I remember your directions and pass it along to my daughter. Might be fun for her to do with her students, and or a few friends who have grandchildren etc. Great idea! 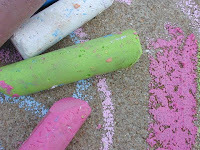 Chalk is inexpensive but how much fun would it be to make our own!